I recently heard an old song that was both nostalgic and unsettling. The song was from the 70’s educational cartoon series, School House Rock. The song, “Elbow Room” features the age of American expansion from the European settlers of the 13 colonies to the Western Frontier. The song is ham handed and socially awkward. Elbow Room romanticizes Euro-colonialism and its close cousin, American styled “Manifest Destiny”. The song which was meant to educate millions of kids does in fact highlight a slanted historical narrative. Many view the expansion of Euro-colonialism as a historical scar that has not healed completely. Many of the people groups trampled in the process of expansion are still experiencing the after affects of forced displacement. To say that history is told from the vantage point of the powerful is an understatement. History is also romanticized from the vantage point of the powerful. I can remember in high school and college being exposed to American History and trying to reconcile a Godly heritage with a history of oppression. I became disillusioned at the concept of the impeccable Founding Fathers and their vision of a city on a hill. The narrative sounds great if you read most textbooks. The Founders and their privilege guided them to re-imagine a land of equality for those they viewed as equal. My guess is that the elbow room needed by the Colonialist originate out of an Old Testament theology of expansion into the Promised Land. The Kingdom of God as found in the gospels looks very different from the imperialism which exploded out of the Constantinian styled church of Europe. While the gospels give a voice to a kingdom characterized by humility and sacrifice—the theme of Euro-colonialism preached oppression and racial categories. The catechizing of non-Whites into a Euro-Centric orientation was perpetrated by aggressive philosophical and commercial expansion. The process of acquiring this elbow room is evident in declarations like the Papal Bull endorsing the Doctrine of Discovery. 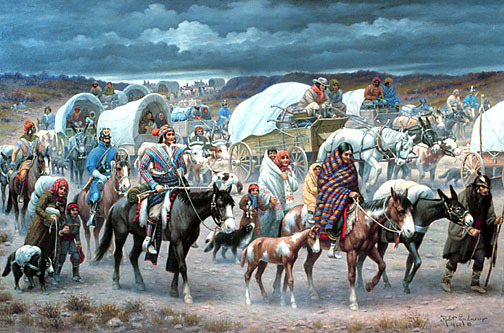 The belief in Manifest Destiny and Jefferson’s Land Survey System reinforced the notion that nothing could or should stand in the way of conquering this new found Promised Land. Later on the Homestead Act of 1862 made possible the acquisition of whole swaths of land occupied by native tribes and Mexicans. This early belief in American Exceptionalism seemed to provide the impetus for unrestrained expansion into these lands. The acquisition of land through unscrupulous means is always a controversial topic. For example, redlining is a hegemonic practice utilized by banks and the affluent to acquire sought after urban space. Whole communities are flipped in order to make room for high-end hipsters and their faux urban authenticity. This is another example of the privileged exacting their will on the less powerful. Unfortunately, gentrification is all too prevalent in neighborhoods where the poor are unable to adequately organize and fight back before it’s too late. This is yet another subtle form of oppression. The acquired elbow room is not without the consequence of displaced people. It is so important that we’re careful not to convey that these kinds of events are without animosity and scars. History lessons can sometimes become opportunities to white wash atrocities committed by flawed men. One of the most difficult classes that I’ve ever sat through was during undergrad when I heard a professor tell me that the Founding Fathers were excused for their racist practices and philosophies because they were a product of their times. These kinds of statements inhibit the process of reconciliation—specifically when the topic is racial reconciliation in Evangelical or secular realm. The truth of our collective past helps to dispel the view that America is some kind of Utopian society. This land is one of the greatest nations on earth, but it does not come close to the eschatological hope promised by Christ in John 14:1-4 and the New Jerusalem in Revelation 21:1-27. I believe it is fair to say that the past atrocities can be lessons learned and can equip the church in its ventures into the world. The church, if not careful, can communicate a kingdom that is much different than the one Christ put forth in the gospels. The post-colonial nations are familiar with the language of colonial conquests. The language of Scripture has been used to suppress native peoples on more than one occasion. The practice of expansionism vis-à-vis missionary efforts can carry a stench that repels others away from the gospel. We may not seek to conquer a nation and to pillage resources, but we can seek to convey our way of life as gospel truth much like the French with their civilizing missions. As an African American father, I am sensitive to what my son and daughter learn about the land we call home. Both of them must know the historical significance of this place—specifically that there is this dichotomy between what was written and what was practiced. They will have pride at the myriad accomplishments in science, education, medicine, government, space travel, etc. It is also my responsibility to help them understand the shameful things like the Trail of Tears, Jim Crow and the Japanese internment camps. The way that I understand the Biblical figure of David, who was a man after God’s own heart, but in disobedience conspired to murder and cover up his wrong doing. David’s story is inseparably dualistic. (2 Samuel 11:1-27; Acts 13:22) His story highlights that a man can be a fallen creature with an unshakeable love for God. The nation’s glory and its atrocities are inseparably woven together and cannot and should not be undone. There is only one who is good. (Matthew 19:17; 1 Peter 2:22) Atrocities are present in every culture as the human heart is desperately wicked. (Jeremiah 17:9; Romans 3:23) These events cannot be forgotten, but attempts to erase them throws salt into the wound of those dealing with a fractured past. The power of redemption is that we look for God to resurrect our broken past and sinful present into something that will bring Him glory. C. Eric Lincoln remarks, “In the New World, labor was short and the market was aggressive. As a result, there were 500,000 slaves in the American colonies by the time of the Revolution—an embarrassing statistic patently inconsonant with the brave rhetoric of the Founding Fathers and the moral principles of an avowedly Christian nation.’ Lincoln, C. E. (2003). The Racial Factor in the Shaping of Religion in America. In C. West, &amp; E. S. Glaude, African American Religious Thought (pp. 156-186). Louisville, Kentucky, USA: Westminster John Knox Press. http://digitalcommons.macalester.edu/cgi/viewcontent.cgi?article=1012&amp;context=intlstudies_honors. la mission civilisatrice (civilizing mission). This described French colonialization in the nineteeth and twentieth century through the framework of idealogy. The French spread their ideals to conquered peoples by modeling what they believed was a culturally advanced society. “The Bible was read within racial difference, and racial difference was read into the Bible.” Jennings, W. J. (2010). The Christian Imagination, Theology and the Origins of Race. New Haven: Yale University Press, p.240 There is a rich history of colonial oppression utilizing the Scriptures to develop the categories of White and Non-White. “In 1095, at the beginning of the Crusades, Pope Urban II issued an edict-the Papal Bull Terra Nullius (meaning empty land). It gave the kings and princes of Europe the right to “discover” or claim land in non-Christian areas. This policy was extended in 1452 when Pope Nicholas V issued the bull Romanus Pontifex, declaring war against all non-Christians throughout the world and authorizing the conquest of their nations and territories. These edicts treated non-Christians as uncivilized and subhuman, and therefore without rights to any land or nation. Christian leaders claimed a God-given right to take control of all lands and used this idea to justify war, colonization, and even slavery adl.org/education/curriculum_connections/Doctrine_of_Discovery.asp. Gentrification – http://geography.about.com/od/urbaneconomicgeography/a/gentrification.htm . Gentrification is not always evil if the process allows for the improvement in the quality of life for the residents. Many times this practice displaces the poor. There are countless accounts of atrocities against Native peoples. One look at the reservation system confirms the ongoing scars of Colonialism and Westward expansion. Thank you. I’ll start with you on Friday. 2 other things. I am not listing all of the sources, but I am keeping the footnotes and then adding the link from your site in case anyone wants to see more. I trimmed a few words off one sentence if that’s OK. Do you have a FB page I could link to or just Twitter? What specifically was trimmed? You can send to me via email kylecanty@hotmail.com. I don’t mind a sentence being trimmed as long as my thoughts are still intact. We can correspond. It may not be a big deal. You are up. http://www.dorothygreco.com/an-invitation-to-listen-kyle-cantys-elbow-room-historic-roots-to-oppression/ Are you on FB? if so please friend me so your name pops in when I post. THANKS. I love this piece and hope it generates good conversation. Hi Kyle! So glad to have come across your blog. I was just talking to my now-adult children about the Elbow Room video, to see if they remembered it. I used to fuss about it when it came on when they were young. We watched it together on Youtube and were even more appalled as we’ve all spent quite a bit of time reading more on American history and listening to podcasts and watching documentaries, etc., especially from a POC perspective. This captivity of mind that the idea of Manifest Destiny expresses continues, as seen in our relationships of militarism, dominance and influence that engenders economic exploitation in places like South and Central America as well as countries like Iraq. It seems we really don’t repent of sins, [we as in white people in power], especially the idolatry of Americanizing our Christianity; it just seems to morph into other expressions, resurfacing under different guises for the times at hand. So true Karen. There are a lot of lessons to be learned from how society has sought to envision these past atrocities. In order for real healing to take place we need an accurate picture of the actual offense. Appreciate you reading this post. blessings.